Yes, once again I found myself with over-ripe bananas that I needed to use. I think it happens at least one a month, but no one was complaining this month after I made this cake! It was soooo good. 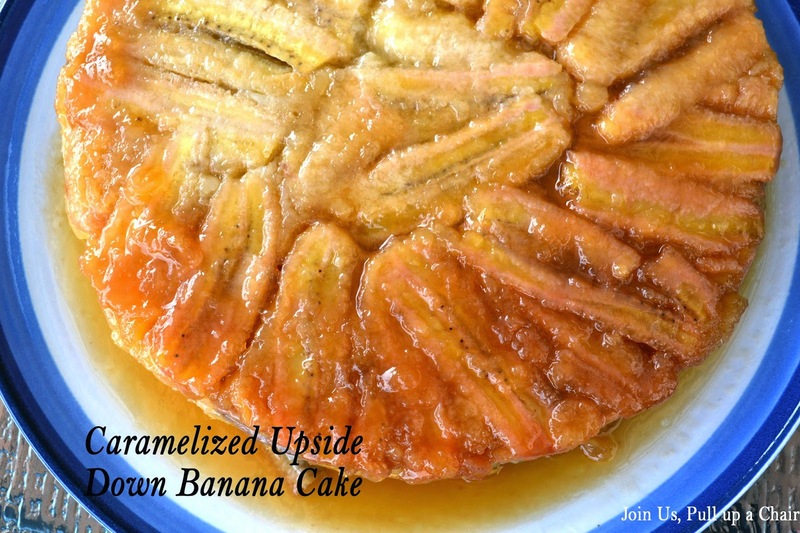 The cake is moist and light, and then the caramelized bananas with the melted butter and brown sugar glaze, takes it up a notch. I really can’t put it into words, trust me, you just need to make it for yourself. Preheat oven to 350 degrees. Lightly spray a 9 inch springform pan with nonstick cooking spray, place on a baking sheet and set aside. Pour the melted butter in the bottom of the pan. Spread the butter around to make sure the entire pan and sides are well-coated with butter. Sprinkle the brown sugar over the melted butter. Begin to cover the bottom of the pan with the sliced bananas in a pinwheel. Use small pieces of banana to fill in the gaps. Add 8 to 10 short banana pieces around the sides. In a large bowl, whisk together the flour, sugar and baking powder. In a smaller bowl, combine the egg, buttermilk, sour cream, oil and vanilla extract. Add the wet ingredients to the dry ingredients until just combined. Gently pour the batter over the bananas. Bake for 40 minutes or until the center of the cake is set and golden brown. Remove from oven and place on a cooling rack for at least one hour. Once cooled, invert the pan on a plate. Remove the pan and allow the butter sugar mixture to flow over the cake. Slice and serve.